The music business has changed a LOT in the last 10 years. Technology has opened up so many opportunities to Indie Artists, introducing a whole new breed of “overnight success stories” who have a video go viral and suddenly they are the next big thing. But for every one of those overnight sensations, there are hundreds of thousands of musicians trying to build a following online and offline so they can become a professional musician who makes a steady living from music. There is a lot of competition out there because technology has made it possible for just about any artist to share their talent (or lack of talent) with the world. But the good news for you? The bulk of the Indie artists out there don’t know the right way to build a music career. But because you’re reading this, you will learn how to do it right from the beginning and have the upper hand on your competition. You see, most musicians don’t know how to systematically build their fan base from the ground up to create a sustainable income from music so they can become a full-time, professional musician. Instead, many artists spend all their time and energy (and often money) trying to get the attention of Music Industry “decision-makers” at record labels who they think hold the key to their future. They try this tactic and that tactic, grasping at straws, hoping to get “discovered”. They don’t understand that the new music business doesn’t work that way anymore. I get it, because I did exactly that for almost 10 years. I wanted so badly to escape my 9-to-5 job as a Director of Finance. I wanted to exchange the hum-drum drudgery of an office job for an exciting, passion-driven career as a professional musician. But I had no clue how to start. So I spent a ton of time and money doing all the wrong things only to end up frustrated and back at square one. Because you have the opportunity to learn from my mistakes and start off on the right foot, take the right path from the beginning ,and build a lasting career step-by-step from the ground up. I call this framework the Musician’s Profit Path because it’s a step-by-step, long-range plan for any unknown indie artist to build a solid, sustainable, and profitable music career. I’ll outline the steps for you in detail in a minute. But first, I need to lay a little ground work. In the old music business, inking a record deal was the holy grail. In fact, it was almost exclusively the only way to make it as an artist. This was a huge barrier to entry for unknown Indies. Nowadays, that barrier has been removed. There are loads of successful unsigned artists making a living from music, hitting the radio and records charts and touring the world. The playing field has rapidly expanded, and with it, come massive opportunities for artists. And how do the labels fit into this new music economy? In the new music business, the record labels don’t have budgets like they used to have for developing new talent. They are looking for artists who have already honed their craft and built a sizable following online and offline. So, whether you decide to eventually get signed to a label or not, you’ll still have to do the hard work to build a fanbase, which is why this 5 stage blueprint is so valuable. For those artists who do understand the rules of the new music business, they usually fall into a different trap. They try to copy all of the different tactics they see successful artists using. Most of the time this doesn’t work. Strategies that work for artists who have already had some success won’t work for beginners. They just aren’t effective. Or even worse, unknown artists spend lots of money on PR agents and radio promoters when they haven’t even put their foundational pieces together yet like a musician website and a social media following. This “cart before the horse” scenario is like trying to sell a house before you’ve even laid a single brick. I hate to see artists waste their money like this! Don’t get me wrong, PR and radio campaigns can be very useful for those in a later stage of their career. But I definitely don’t recommend them for those in the early stages of career growth. Save your money. To save you money, time, headaches and heartache, I’ve created this 5 stage blueprint so you can build a solid foundation and then add the right bricks at the right time to construct an unshakable, profitable music career as a professional musician. The 5 stages take you from Foundation to Profession in a step-by-step format so you know what to focus on when (and what not to focus on!). So, if you’re in the early stages of a music career, what should you do, and in what order, to make sure you’re not wasting time and money on things that won’t work for you? If you’re in the intermediate stages, what new marketing tactics should you add along the way so you can expand your fan base to a wider audience beyond your core group of super fans? How will you know when it’s time to invest in a PR or radio campaign so you can make the most of the opportunity? 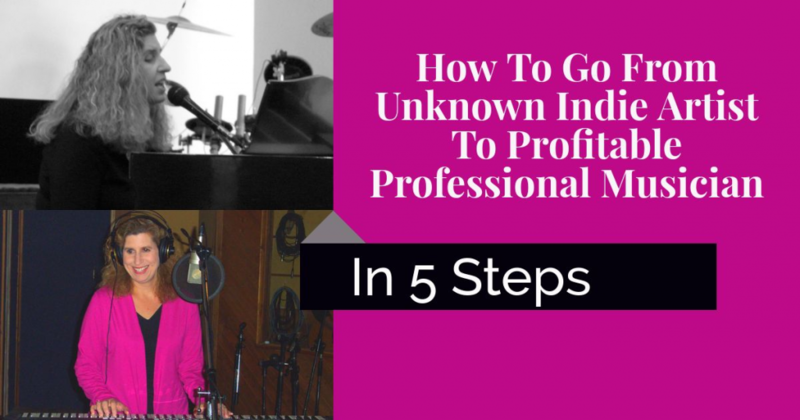 The Musician’s Profit Path is a plan you can follow so you can make progress everyday toward a profitable career as a professional musician? 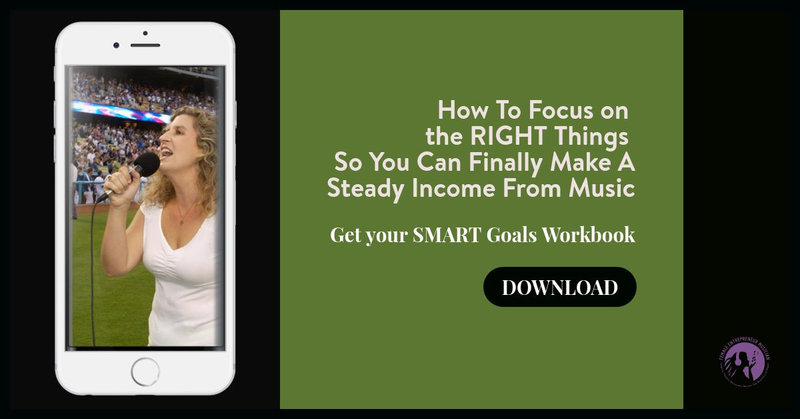 I developed this 5 stage blueprint from years of trial and error, incorporating what I did right along with adjustments based on all the mistakes I made along my journey to becoming a profitable professional musician. Keep in mind, this is how I would do it if I started over from scratch today, knowing what I know now. I realize that you may not be solidly in one stage of this plan right now. You may be in a few different stages i.e. you may be in stage 1 for marketing and stage 2 or even 3 for performing, or vice-versa. That’s OK. The purpose of the 5 stage blueprint is to help you know what to do when, and to reveal the important pieces you accidentally (or purposefully) left out along the way. So if you did things out of order, don’t worry. Again, this framework is here to help you…not to shame you. As you read through the blueprint, take note of what stage best describes where you are right now in the areas of marketing/branding, fan base building, performing and career management. 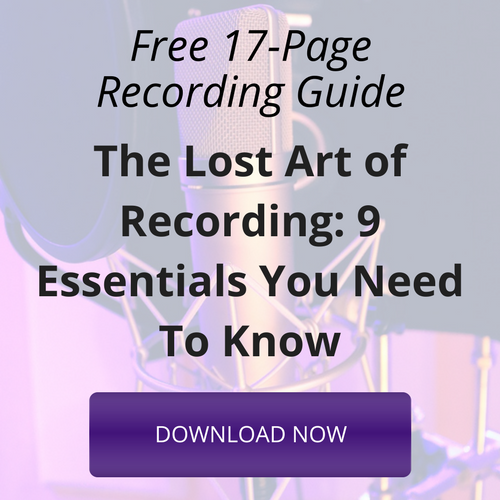 This will help you know where you need to make improvements or course corrections so you can reach your goal of becoming a profitable professional musician faster and easier. I’ve laid the 5 stages out below, but if you want a more in-dept look at what to focus on and not focus on in each stage, the emotionals you’ll experience during each stage, and the benchmarks you need to hit to move to the next stage, Join me for our next Musician’s Profit Path Masterclass. The Foundation stage is exactly what the name suggests – the beginning stage where you get clear on your core values, your brand and your target audience. So many artists skip this crucial step! If you don’t do this important ground work, you won’t know how to market and promote your music in stage 2 and beyond. During this stage you’ll also create your online platforms and develop your onstage persona and delivery. Take an inventory of your talents, your experience and your desires. It’s really important to know why you want to be a professional musician and what exactly you have to offer your fans before you start trying to market yourself. This personal inventory will help clarify what you want your artist brand to look like. Is your brand fun and playful or more serious? Do you have any life experience you want to highlight i.e. you’ve traveled the world, you have unique cultural heritage, you overcame a huge obstacle, you’re a mom, etc. Do you have specific musical training (like at a prestigious school) or are you self-taught? Are you bold and “in-your-face” or more understated? How will you weave your personal story into your brand? Are you only focused on making great music or do you have an underlying cause or belief you want your music to be a platform for? Asking yourself these kinds of specific questions will help you narrow down your brand identity. Then it’s time to start making choices for colors, fonts, and general look and feel. You’ll also need some photos that align with your new color and mood scheme. Next, to understand your brand positioning, you need to know more about your current and potential fans. It is very important to understand as much as possible about your potential fans so you know the best way to reach them, both online and offline. This information will determine which online platforms you choose to focus on and what kind of performing venues you decide to pursue. From here, you create your online platforms. This is the time to “stake your claim” online. It is very important to have a branded, well-organized website where fans can learn about your music and connect with you. Just having a page on a shared platform like Facebook or a music site like Reverb Nation, Soundcloud or Bandcamp isn’t enough. You don’t own those platforms. If you set up shop on “rented land”, you never know if it will be around tomorrow. You want to be in control of your own domain. Speaking of domain, you need to purchase your branded domain name so it/s easy for fans to find you online. Just check to see if “yourname.com” or “yournamemusic.com” is available from somewhere like GoDaddy. For musicians, I always recommend using BandZoogle (use promo code WOS15) to quickly and easily build a professional website. Bandzoogle is build by musicians for musicians so it has all the features musicians need like streaming and downloadable audio, music and merch sales (commission-free), a built-in mailing list and an EPK. If you sign-up with Bandzoogle (use promo code WOS15), you even get your domain name included for free. And they handle all the tech stuff. Now that you’ve checked the website off your list, move on to setting up your social platforms. As a musician, you should definitely maintain a YouTube channel. Even if you don’t have videos to put on there yet, if you set it up with your brand artwork and colors, it will be ready when you start posting videos. Once you start live streaming and performing, you’ll quickly have content to start building your channel and playlists on YouTube. On what platform do you feel comfortable and like to hang out? Choose one platform and set it up with your branded images and description. Put up some introductory posts and media so you’re ready to start engaging with fans as they visit your page. The final asset you need to establish is your mailing list. I realize that at this point you may not have anyone on your list yet. But during the Foundation stage, I want to challenge you to get your first 100 subscribers. I know this might sound daunting, but I promise it is much easier than you think! The key here is to pick one and get started. Don’t get bogged down with this decision or you’ll never start building your list. And since we’re talking about the steps to becoming a professional musician (not an amateur), I think it’s important to mention that looking professional from the beginning is important. On that note, don’t use your regular email account to send out group or blind copy messages. Not only do you look like an amateur, but your emails will probably get flagged as spam and deleted or worse, blocked. Now that you’ve picked an email service provider, it’s time to build your list starting with your first 100 subscribers. Watch this video for a run-down of the steps. Reach out to 10 of your friends. Tell them that you’re creating an easy way for fans of your music to find out what’s going on with you, when and where you’re playing a show, when you’re releasing new music, when you come out with a new video. And, tell them that you’ll also be giving away some cool prizes to your fans. Then ask them if it would be OK to include them on the list and could they provide their best email address. Reassure them this is only for purposes of fan updates and that you won’t share their information with anyone. Collect those emails in a document or even on a piece of paper (at least for now, until you’ve setup an email service provider as mentioned above). Go through your email contacts, Facebook messages, Twitter, your texts, anywhere you interface with friends on a regular basis. Send the request to 10 at a time until you’ve reached 100. And if you finish the exercise and get to your first 100 subscribers…Congratulations! You now have a bigger email list than over 50% of all Indie Artists (I actually researched this)! During the foundation stage, you need to develop your confidence on stage, stage presence, your attractive artist character and learn how to create rapport with the audience. The best way to achieve this is through regular performances at open mics, coffee shops and small venues. Many atists expect to get paid to perform right away. While I understand that you may be a skilled musician, getting paid as a performer is about a lot more than skill. A profitable professional musician is not just a player or singer, they are an entertainer. Skillful execution of a song is just one piece of the puzzle. You need to develop a high degree of comfort on stage. This includes creating connection with your audience, including the ability to banter between songs, capture their attention with engaging stories, and make the show visually interesting by switching up your position, instrumentation, etc. Once you’ve performed enough so you feel like these elements are “dialed-in”, you are ready to start getting paid for your performances. You’re ready to move on to house concerts and small venues for pay in stage 2. Now that you’ve built your foundation and feel comfortable on stage, you may be thinking it’s time to record an album. That’s where my advice differs from a lot of other music business coaches. I think investing a lot of money into recording an album professionally at this stage is premature and a recipe for disaster (or at least disappointment and debt). In the beginning of stage 2, you only have 100 fans on your mailing list. You haven’t performed enough at reputable venues to have established a following, and you don’t have a social following yet either. You are not in a position to invest in a recording yet because you don’t have a large enough fanbase to sell it to. Recording a full project at this stage will most likely result in a garage full of boxes of CDs that you can’t sell. Or, if you opt for an online-only release, you won’t have enough people clicking and buying to recoup your production costs. Instead, what I want you to do during this stage is record one really good track to use as an “ethical bribe” to build your fanbase. In stage 2, you need something really good to give away so you can expand your fanbase beyond your inner circle. This is what I like to call a “freemium” (free premium download) and it often comes in the form of one high-quality single or a well-produced live recording. Freemiums are not limited to tracks, so if you have an idea for something you think your audience would love and be willing to trade their email address for, then run with it. If you’re using BandZoogle, they make it very easy to offer your freemium in exchange for an email address. If not, you can use 3rd party platforms like Noisetrade or Bandcamp, but you’ll have to export the email addresses periodically into your email service provider. This isn’t called the Promotion Stage for nothin’! It’s time to pimp that Freemium everywhere you can. This includes making it a prominent offering on your website, putting links and posts about it on social media, giving out the link on live streams, and mentioning it at your live shows so you can get in-person signups. It’s time to put your PR hat on. At this stage, you shouldn’t be looking to spend money on a PR firm. You haven’t built up your platforms and fan base enough to take proper advantage of that kind of investment. So you’ll need to step up to the plate and get comfortable with pitching your music and your personal story to the media. I encourage you to start small. Reach out to media outlets in your local area. Call or visit the local paper, magazines with local distribution and any local radio stations or cable access TV shows. Not only will it be easier to get coverage because you’re a local interest story, but this limited coverage will give you an opportunity to get comfortable talking about yourself in pitches and interviews in a low-pressure environment. PR is definitely an art form and not often something musicians are comfortable with, so start small and build some confidence and momentum. Once you have some local press under your belt, you can use it as social proof to land coverage in media outlets with a wider distribution in stage 3. Send an email to your list at least twice per month. It’s important that you stay “top of mind” with your fledgeling fanbase so you can develop an ongoing relationship with them. You also want to be the first one they think of when a performance opportunity comes up. What do you talk to them about every 2 weeks? By connecting with them every other week, you show them that you’ve got stuff going on with your music career regularly. It creates a feeling of excitement for your fans that they are part of something exciting that’s growing and moving forward. Writing emails that are short and sweet with a single call-to-action makes it clear to your fans what you want them to do. This helps avoid the confusion of a long newsletter and shows them exactly how they can support you. Boy do I wish I had this opportunity when I was first building my fanbase! Live streaming is a golden opportunity to develop a relationship with fans anywhere, anytime. It allows for a level of connection and engagement that is usually only possible during a stage performance. Here are some other benefits that make it such a great promotional opportunity, especially for artists in stage 2. You can repurpose it in your newsletter or even upload it to other social channels for increased exposure. Just don’t get bogged down by perfectionism. The appeal of live video is that it’s real. So be yourself, warts and all. Obviously try your best to create a great experience for your fans, but don’t let your desire for a flawless performance stop you from engaging with fans on your live streaming platform of choice. Perform at small venues and low paying gigs. You’ve paid your dues in The Foundation Stage – you’ve earned the right to get paid. You can now approach venues with confidence, knowing that you deliver a killer show, and ask to be paid what you’re worth. You may want to start trying to book yourself as an opening act for other artists. Or if you have a decent local following, you may be able to negotiate a headlining spot at a small local venue. You’ll get some great experience and hopefully some new fans performing at these venues, but they won’t be big money-makers. Most of the time, what these venues can pay you will barely cover travel expenses, which is why the best route to profit in the Promotion Stage is House Concerts. It’s one of my most popular courses. In The Promotion Stage, the best path to booking house concerts is through your existing fans on your email list and social media channels. Your superfans will be excited to show off your talent to their friends by hosting a house concert. One of the best things about house concerts is that the host is generally expected to bring the crowd, so that takes one burden off of your shoulders. This is a golden opportunity that most artists are missing. Wherever you are performing, don’t be afraid to ask for referrals, both from the host and from the audience. Be sure to have a healthy supply of fliers or postcards on your merch table that clearly explain what kind of programs you perform, provide social proof in the form of quotes from venue owners and event planners, and clearly state your contact information both online and offline. Don’t be afraid to mention this document several times from the stage and ask the audience to take them home to give to friends and influencers they know that are involved with venues and organizations that are looking for musicians and programs. Consistently putting yourself out there during the Expansion Stage is what will allow you to grow your fanbase and income to the next level. Yes! It’s finally time. This is pretty self-explanatory. But let me caution you…remember this is your first album. Don’t go out and hire the most expensive producer in Nashville or LA. Do your homework: look for a reasonably-priced producer who works with artists you respect in your genre. Then request references and actually follow-up. Remember, at this point you’ve only got 500 people on your email list. You can’t expect to run a successful crowdfunding campaign or count on everyone on your list to buy the album. So be frugal for this first project. Consider an EP. It’s a great way to test the waters. Don’t feel sheepish about this! Your fans want to hear from you and want to keep up with what’s going on with your music. That is why they are on your list. Just always keep it short and relevant with a little personality and a lot of heart. Since you’ve increased your content production, you should have no trouble coming up with something to talk about each week. Blogs are great for SEO – Search Engine Optimization. As musicians, we tend to have more audio and video content on our webiste than words. Search engines can’t search media, so it’s important to have some written content on your site so your website will get picked up by the search engines and be able to rank for certain keywords. Blogs are also highly shareable on social media and will provide ready-made content for one of your weekly newsletters. A blog is a great place to share news, personal stories and behind-the-song tidbits. And a blog doesn’t have to be long, or even just words. Spruce it up with some images or even video. You already started live streaming in The Promotion Stage. But now you’re going to take it up a notch and do it consistently at a regular time. By committing to a regularly-scheduled live stream, you are forced to keep producing content on a weekly basis. There’s nothing like a little outside pressure to keep you accountable. The musicians I work with that really commit to this weekly live stream strategy have continued to grow their audience each week just from live streaming. Live stream videos also make for great newsletter content. And don’t forget you can repurpose them for YouTube or post on other social channels. At this point, you have lots of interview experience and tons of samples from local media to show you’re newsworthy. It’s time to expand your reach. Piggyback off of what you learned working with local media to start approaching regional or national publications. You should also contact music blogs and podcasts where you can get some targeted exposure online. Search for artists who are similar in style to you on HypeMachine to find blogs and podcasts to target. The first and most important point here is…I’m not suggestion that you automate ALL of your social media interaction. I definitely want you to continue engaging with fans on all your channels. But there are automation platforms like PostPlanner or MeetEdgar that I highly recommend (and have used in my own business for years) to make the initial posting on social media much easier and more stream-lined. I recommend you set aside 1 hour each Sunday evening or Monday morning and plan out your social posts for the week. The platforms I mentioned above make it easy to build a queue of posts so you don’t have to come up with everything from scratch each week. Just add some new content to the queue every Sunday to keep it fresh and make sure to take anything out of the queue that is outdated to keep it current (or you can schedule posts to expire when they are no longer relevant). Decide where you want to tour and get one date booked. That will be your anchor date. You can now start booking other events around that anchor show. 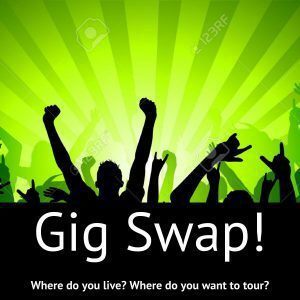 Network with other musicians and find people who play in the area you’ll be touring. Approach them about a gig swap or an opening slot. Contact medium-sized venues and tell them you are coming to town during that particular time window and ask if they would like to book you. Fill in any holes in your schedule with house concerts. Since house shows are more casual and flexible based on the host’s schedule, see if you can fill in some of your off-evening like Sunday or Thursday nights with house concerts. Or, you can even suggest matinees on Saturday or Sunday so you can perform two shows in one day. This three-pronged approach will insure that your tour is profitable and you make the most of your time on the road. This one is crucial during Stage 3 and another important reason we call it the Expansion Stage. Because you are spending a lot of time performing and creating online content, you have little time for the administrative and marketing tasks that still have to be done. It’s time to get some help. The best way to find help is to start with family and friends. Oftentimes, there are people in your inner circle who would genuinely like to help you and would be willing to do it for free, or in exchange for merchandise, concert tickets or a free house concert. You can also ask if your fans would like to volunteer for specific tasks on a barter system. And if you strike out with those two options, there is probably a savvy high school student or college intern in your neighborhood who can do the marketing and administrative tasks you need at a very reasonable rate. It doesn’t matter how you find help…but you need to do it. I can’t stress this point enough. If you don’t get help during the Expansion Stage and continue to try to do everything yourself, you will most likely burn out before you can reach the career heights and financial benefits of the next two stages. At this point, you are having a great deal of success…but is it sustainable? That’s why during this stage you’ll grow your email list to 3,000 subscribers and put some automation in place so your new fans will have even more opportunities to get to know you and eventually buy your music or merch. Because this stage is more advanced, I’m not going to go into detail here on each action you should be taking during this stage. But I’ll list them below so you have a picture of what you’ll be doing once you reach stage 4. 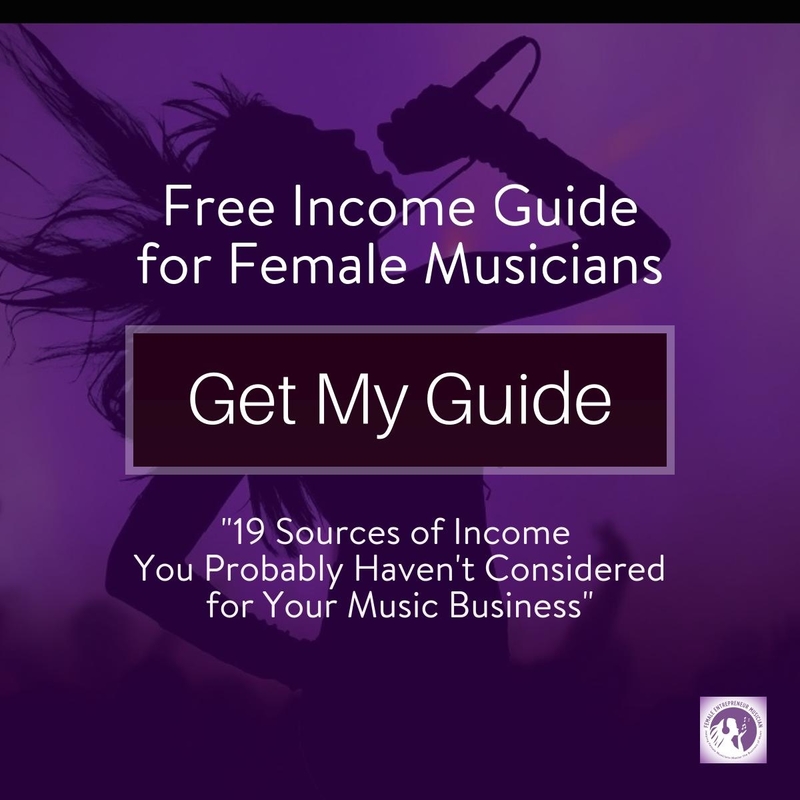 In the Automation Stage, you are on the cusp of developing a predictable income as a professional musician. Once you put these strategies into motion, you will be able to confidently say that you are a profitable, professional musician! Record your second Album or EP once you’ve broken even on the first one. Create a content plan so you always know how to engage with your fans and when. Employ advanced fan­-getting tactics like contests & strategic partnerships with other artists. Book events 2 to ­3 times per week or book several tours of at least 2 weeks in length (using strategy from Stage 3). Setup email autoresponders or chat bots to create an “automated marketing & sales system” that goes out to new fans. Start using Facebook ads to attract new fans and promote your music and events to existing fans. Create a local and virtual “street team” to help you reach more potential fans. Consider bringing on a manager or outsourcing more of the day-­to-­day activities so you can take on the higher level management role or perform more often. Stage 5 The Profession Stage: You’re a Profitable Professional Musician. Now What? You made it! You’re finally a profitable professional musician. You’re on easy street right? 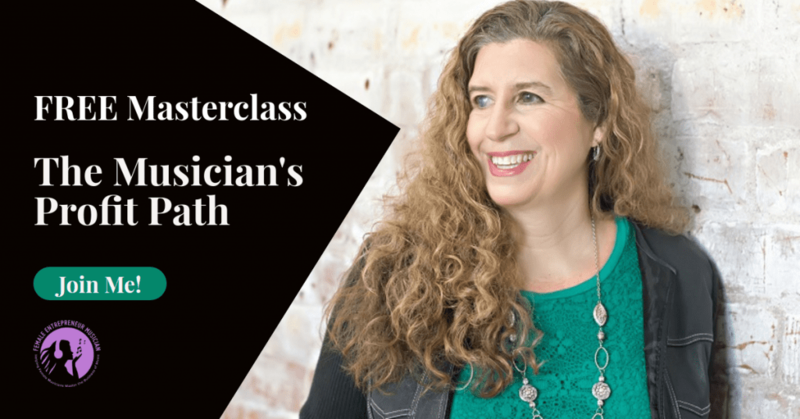 During this stage, there are a lot of decisions you need to make so you can guarantee the continued health and growth of your musician business. The good news is that you’ve built your business on a firm foundation and you have an engaged, supportive fan base of over 3,000 subscribers and even more who follow you on social media. You’ve got the assets in place for continued success. Should you pursue crowdfunding or a record label deal (you may be approached by a label since you’ve put in the hard work and ascended to the final stage)? How should you expand your team? Is you decide to do a crowdfunding campaign, do you need a short-term support team just for that? Should you get educated in sponsorship and try to land corporate sponsors? Should you move into performing at larger venues, corporate events, or keynote presentations that combine music and speaking? How can you develop relationships with Industry Professionals to increase the opportunities that come your way? Should you hire a PR Firm, Radio Promoter, Booking Agent, Artist Manager or other consultants? So now that you understand the complete 5 stage framework, what stage are you in right now? As I said earlier, the stages are meant to be benchmarks. It is uncommon for an artist to fit perfectly into one stage. 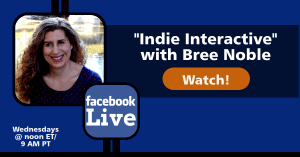 If you’re a newer Indie artist, you’re probably in the Foundation or Promotion stage, or a combination of both. For artists in stages 3 and 4, most find that they have skipped some steps along the way. If that’s you, that’s totally OK. This plan will help identify exactly where the holes are that need to be filled. 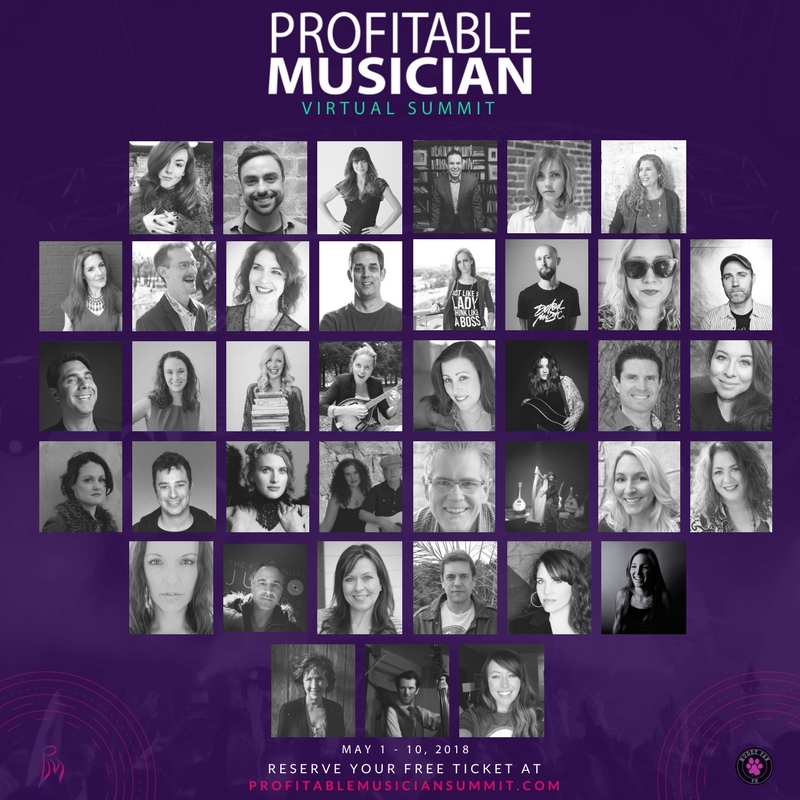 If you follow the Musician’s Profit Path blueprint, you’ll not only build a solid career as a professional musician, but a sustainable, profitable one as well. Want a more in-dept look at what to focus on and not focus on in each stage, the emotionals you’ll experience during each stage, and the benchmarks you need to hit to move to the next stage?